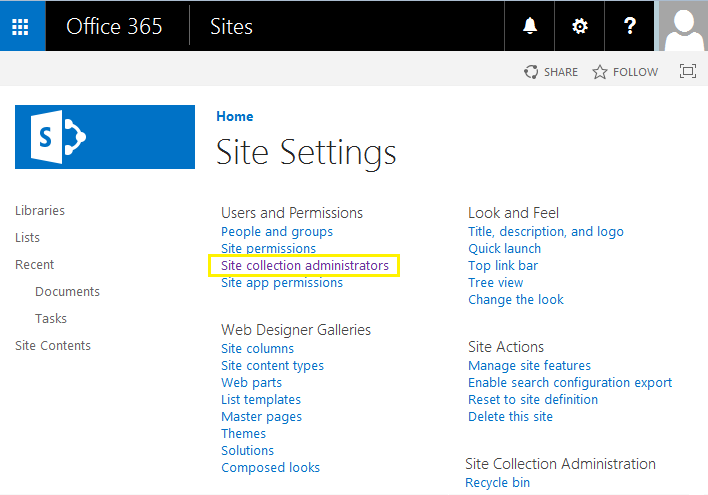 SharePoint site collection administrators have Full access rights to manage all sites under a site collection. 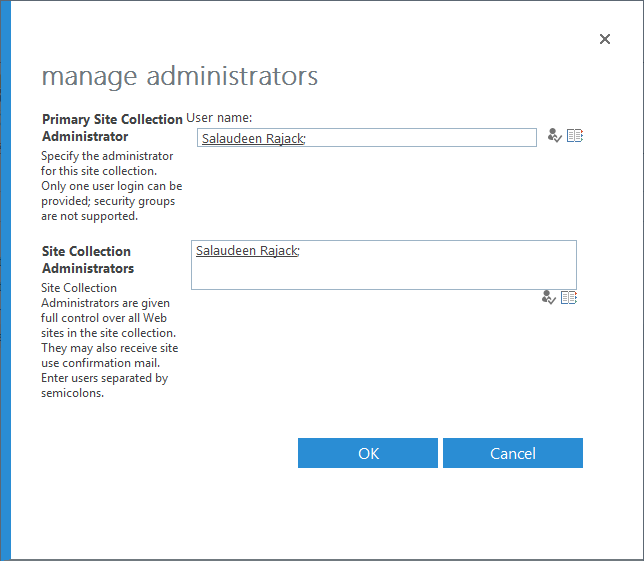 When creating a site collection, Global Administrator or SharePoint Online Administrator will automatically become the primary site collection admin. A SharePoint online site collection can have several administrators, but only one primary administrator, unlike SharePoint on-premises. 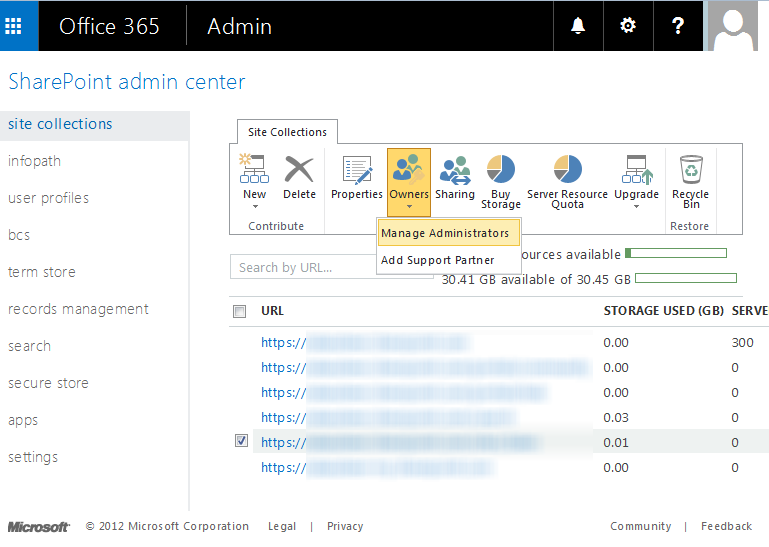 Its possible to add multiple site collection admins for any SharePoint site collection. To add additional site collection administrator in SharePoint online, you must be either Global Administrator or SharePoint online Site Collection Administrator of the particular site collection. Select the site collection, Click on "Owners" button from the ribbon and then click on "Manage Administrators" menu item. This brings "Manage Administrators" page where you can add multiple site collection administrators. Also, provides the option to change primary site collection administrator. Now you can add new admins into the Site Collection Administrators box. Quite easy, isn't it? Well, Its easy for one single site collection. However, there is a problem when you have large number of site collections. Say, you have 100s of SharePoint online site collections, You can't simply select all of your site collections and add a site collection administrator to all of them at one shot! In group connected modern team sites, "Site collection Administrators" link in site settings is hidden. The Office 365 Group Owner is configured as the site collection administrator, by default. So you can add any user to owners group of the Office 365 group in order to make them site collection administrator or use the direct link and add additional site collection admins. Anyway, In SharePoint Online, site collection administrators to be added on a site collection by site collection basis, as there is no web application level users policies can be set from Central Administration as we do in SharePoint on-premises. So, the solution is: Using PowerShell to add site collection administrator in SharePoint online! #$SecurePWD = read-host -assecurestring "Enter Password for $AdminName"
SharePoint online PowerShell to add site collection administrator for all site collections. $Password = Read-host -assecurestring "Enter Password for $AdminName"
SharePoint modern sites are not listed under site collections (or even with SharePoint PowerShell module!). Here is the script to use in "SharePoint Online Management Shell" to add site collection admins to all sites including Modern Team sites. A lot can change in a year and two months. How to remove site collection administrators in sharepoint online using powershell.